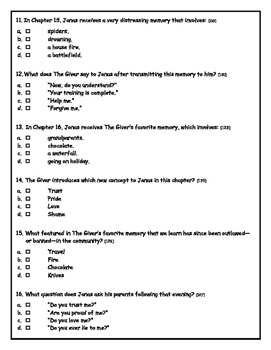 This is a twenty-question, multiple-choice quiz on Chapters 13-17 of Lois Lowry's novel, "The Giver". 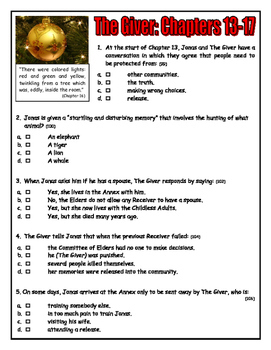 Each question comes with a choice of four possible answers. The number in brackets after each question indicates the page number on which the relevant information might be found. 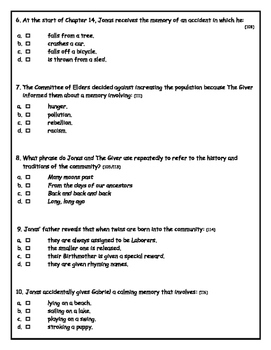 The quiz culminates in a brief activity that encourages the student to reflect upon a soothing personal memory.